For years, tech employees of companies in Silicon Valley have enjoyed free meals around the clock. That's changing — at least in Mountain View, where the city is banning the social media giant Facebook from offering free food in its newest office building. Currently, Facebook's main campus in Menlo Park is the stuff of lore. The 430,000 square foot compound offers perks like an onsite cleaners, a dentist and free food — basically a smorgasbord of anything your heart desires — custom omelets, braised beef, handmade sushi and desserts often made to order by trained chefs. But about eight miles away, in Mountain View — also the home of Google — free food, at least at the new Facebook campus — won't be on the menu. Under the agreement between Mountain View and Facebook, meals within the Facebook offices can't be subsidized by more than 50 percent on a regular basis. However, the company can fully subsidize meals if employees go to restaurants that are open to the public. Mayor Siegel acknowledges there are still a few kinks that need to be smoothed out. Erika Rasmussen, the manager of Milk Pail Market, an open-air grocery store next to the new building, is looking forward to figuring out the best way to serve the 2,000 employees expected to converge on the area when the new office opens. "We don't want Facebook to overwhelm this area, but we do want Facebook to support this area, because we will need their patronage to survive," Rasmussen says. 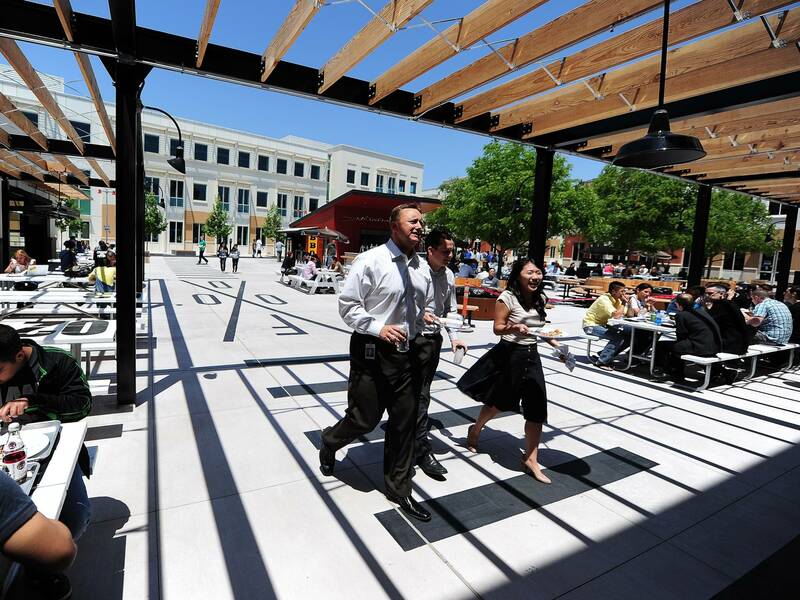 The city of San Francisco is considering a similar measure that would ban cafeterias in all new office buildings, forcing tech employees to venture out and share a bit of the wealth outside of their walls.